When Darth Sideous was forming his plan on taking over the galaxy he called upon one up-and-coming Sith Lord to aid him in bringing down the Jedi. And of course this cat was known as Darth Maul. This most evil of all Siths took it upon himself to take on both Qui-Gon Jinn and Obi-Wan Kenobi in a battle of lightsabers. If you think you have what it takes to suit up as this Dathomirian baddie, you can finally transform into the villain when you pick up this Super Deluxe costume for adults! All you'll have to do is queue up Duel of the Fates on your phone, and you'll be ready to hop into a power generator complex to take care of any Jedi who are giving you a hard time. Well, as long as you have your trusty twin sided saberstaff handy (sold separately). Yup, when you go as this top flight Sith apprentice, we're sure that no Jedi are going to be able to cut you in half! 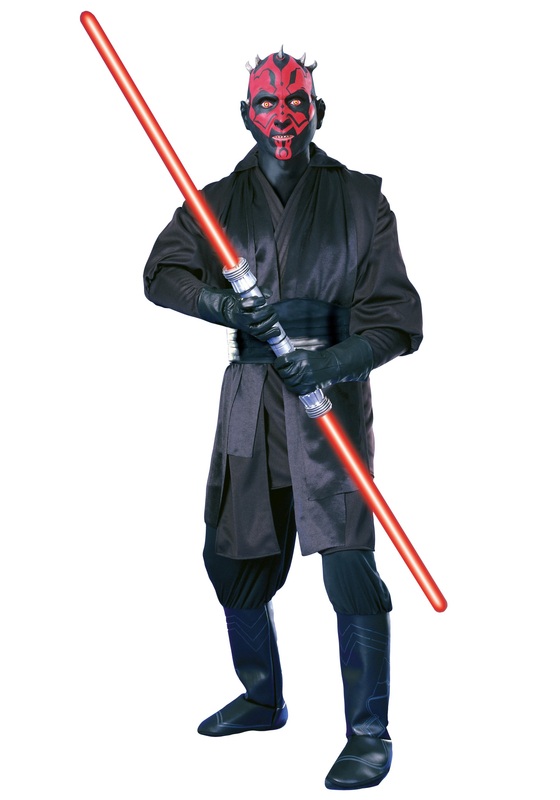 This Darth Maul costume will have you ready to relive all of The Phantom Menace action. The all polyester tunic and pants set gives you the dark look of the sinister character. Just use your own long sleeve black shirt, pop the boot tops over your own shoes, and complete the look with the detailed latex character mask. We're sure that when you become this iconic Star Wars villain, you're most certainly going to live up to the hype!